This evening chess24's Miss Strategy, IM Anna Rudolf, took part in a special match playing a new chess variant dubbed Quantum Chess. She faced the creator of game, Chris Cantwell, a graduate student at the University of Southern California. Replay the full show, and learn a thing or two about quantum physics along the way! In 2013 I was studying for a Masters at the Polytechnic University of Gdansk (Poland). During a course on nanotechnology I was asked to introduce some applications of quantum mechanics, and indeed that's where I first found out that there were different forms of "quantum" chess. Many games, especially chess, have always been considered as a valid test to see if a computer can show some form of intelligence. Computers use "brute force" or massive information processing in parallel where the game is modeled as a tree. By contrast, humans use reason and intuition. Humans lost the battle some time ago against chess computers, with the turning point being the victory of Deep Blue against Garry Kasparov in May 1997. It is undeniable that the scope of chess is immense, but it is also true that by adding a new simple rule, an infinite world of new possibilities opens (for instance, chess960 , a.k.a. Fischer-random chess). Already in 2010 Dr. Selim Akl, of the Queen's University in Ontario, Canada, noted in a scientific article that one of the advantages of quantum chess is that it restores (at least for a while) the balance between humans and computers, thanks to concepts such as superposition, uncertainty, interference, entanglement, etc. All pieces except the pawns can make either a normal move or a quantum move. With a quantum move, the piece is placed in a "superposition" with two possible outcomes: a 50% probability that it can make up to two consecutive movements and the other 50% probability that will not move at all (i.e. 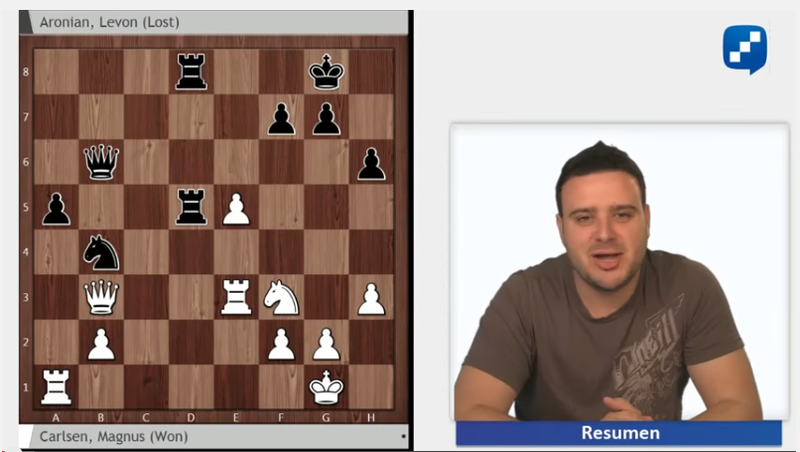 if you decide to move your king from e8 to e7, you do not know if it will actually end up on e8 or e7). Chris Cantwell, creator of "Quantum Chess"
This concept allows pieces to become intertwined (or entangled). Having pieces in superposition can lead to situations where a square may be occupied by two different pieces at the same time. When this occurs a measurement is performed to determine which piece ends up on the square in question. Well it has come time to mess with physics! We will try to explain, in simple terms, what is meant by superposition and entanglement concepts from the point of view of quantum mechanics. When we speak of the universe, we think of galaxies, stars and planets that we can see with telescopes thousands of kilometers or light years away. We think of bodies moving according to the laws of gravity. However, there is "another universe": an invisible world that rules over everything we see. This is a microscopic world — not the size of a star, but that of an atom — where laws are much less intuitive than in our more familiar macroscopic world. At this scale matter behaves so differently that scientists have developed a completely new theory to explain what happens. 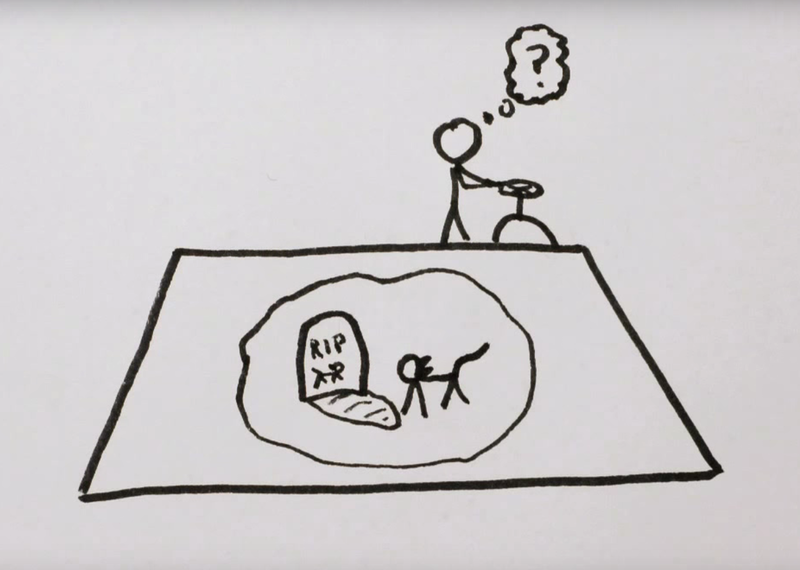 In "quantum theory", subatomic particles do some pretty strange things. They are invisible, they can pass through solid objects, and they can be in several places at a time. The latter seems the stuff of science fiction, and yet it seems to be true in the quantum world. The Schrodinger equation describes the evolution over time of a massive subatomic particle with a non-relativistic wave nature. And you thought the Najdorf Defence was hard! Here alpha and beta are the odds that the Nl and Rr statements are presented. 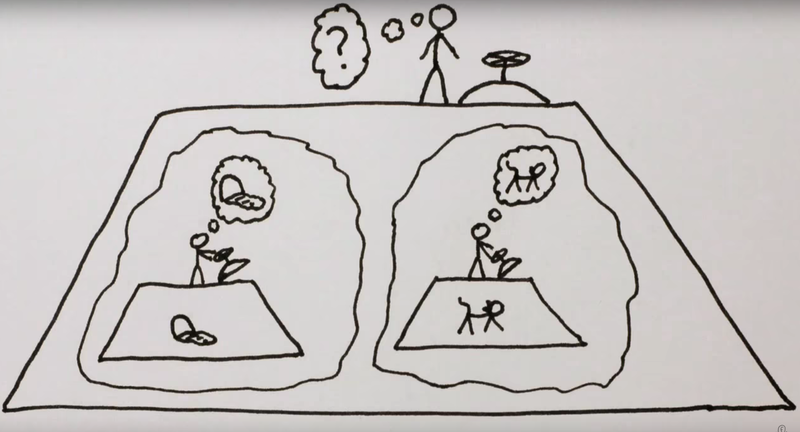 To make this easier to understand, we will explain the experiment called Schrödinger's cat or paradox. 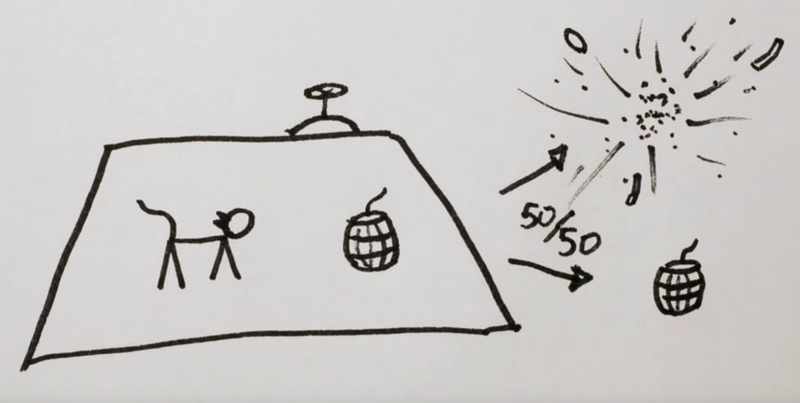 Imagine that we have a box with a cat and some quantity of gunpowder that will explode with 50% probability in the next minute. Until we look inside, we do not know if the cat is dead or alive (see figure 1). If we repeat the experiment many times with different cats, etc., we can see that in half times the cat survives and the other half he dies (see figure 2). The interpretation of quantum mechanics says that before we take a look inside, the cat is in a superposition, that is, dead and alive at the same time (see figure 3). Our act of looking at nature actually forces one or the other outcome (literally curiosity killed the cat). The reality is that we are in the same situation as the cat (see figure 4): the cat lives and we see it safe and sound, or dies and we find him so. So the question is: who observes us to force nature to collapse into one reality? Well, we will not solve that one here, because this is one of the issues not yet resolved in all of quantum physics. 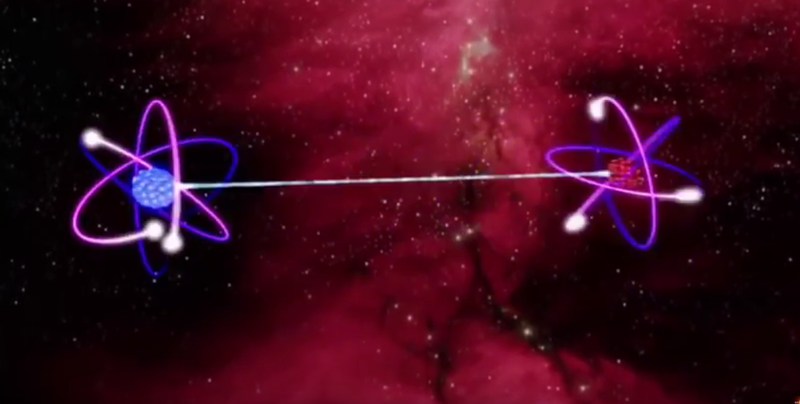 The key to understanding all quantum phenomena is a process called quantum entanglement and now scientists are very interested in this amazing discovery for both civilian and military purposes. In quantum mechanics, what happens to a particle that is in some position, A, can instantly affect a particle in position B — and position B could be billions of light years away from A. Here is the process: when two subatomic particles interact, they can "intertwine", which means that the position or other properties go hand in hand. If you measure any property in one particle, that instantly determines the value in the other particle. That means for example that if a scientist finds a particle "intertwined" and forces it to rotate in a clockwise direction, the other particle will begin to do the same. This statement is very interesting because what it indicates, or at least suggests, is that information has traveled faster than the speed of light from one particle to the other. This I do not understand nor does anyone! Einstein called it "spooky action at a distance". Well folks, I hope you liked this not so conventional bit of news on our website, and if you want to learn a little more about the idea of quantum chess by all means watch Anna Rudolf's show. The 2-game match ended in a 1-1 tie! Jose "Pepe" Cuenca is a grandmaster and civil engineer. Currently he combines chess competition with his work as a researcher at the University of Hamburg and work with chess24.